No Smoking. Stop Engine. Warning. It is unlawful and dangerous to dispense motor fuels into unapproved containers. Only persons of licensed age may operate pump and remain near vehicle while fueling. Keep children away from pump. By order of state fire marshal. Static Electricity Spark Explosion Hazard. Discharge your static electricity before fueling by touching a metal surface away from the nozzle. To prevent static charge, do not reenter your vehicle while gasoline is pumping. If fire starts, no not remove nozzle. Back away immediately. No filling of portable containers in or on motor vehicle. Place container on ground before filling. 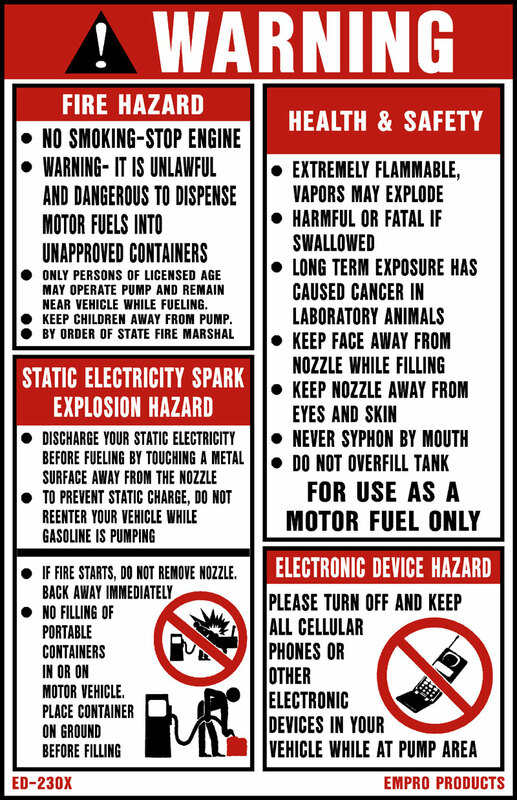 Extremely Flammable, Vapors may explode. Harmful or fatal if swallowed. Long term exposure has caused cancer in laboratory animals. Keep face away from nozzle while filling. Keep nozzle away from eyes and skin. Never syphon by mouth. Do not overfill tank. For use as a motor fuel only. Please turn off and keep all cellular phone or other electronic devices in your vehicle while at pump area.